a) Endorsed the Let’s Get Wellington Moving (LGWM) Recommended Programme of Investment (RPI) as a programme business case. b) Noted ‘endorsement’ indicates a commitment to develop the LGWM RPI to a stage where it can be implemented, but does not commit the NZ Transport Agency to fund that implementation, in whole or in part. c) Noted the LGWM RPI has an estimated capital cost (P50) of $4 billion and an indicative Benefit Cost Ratio (BCR) in the range 0.6 – 1.7.
d) Notes the need for significant further work on the feasibility of funding and financing arrangement for LGWM, in conjunction with similar and coincident requirements for the Auckland Rail Project. e) Agrees there is a need to understand the entire commitment required for LGWM before embarking on the next stage, which includes detailed business case preparation, and implementation of early improvements. “NZTA have decided what they want, it’s simply that they can’t find the $4 billion they think it will cost.. I think that is probably right. NZTA have evidently seen a report from LGWM, which has had a QS run a number past it (in the order of $4 billion, i.e. two to four more projects the size of Transmission Gully). The BCR stacks up, just, depending where you get the numbers from. Then it gets interesting: “in conjunction with similar and coincident” Auckland Rail, i.e. so they actually ARE looking seriously at some form of Light Rail for Wellington, and importantly are discussing it in the same breath as Auckland. The obvious, sensible thing to do would be to purchase the same type of system and cars, so that there are common materials, parts, drives, bogies, signalling and even drivers. That would be forward thinking and could bring costs down. On the other hand, it would lock us into one supplier – great if you pick a good supplier, bad if you do what NZ normally does (i.e. pick the cheapest deal and get a lemon). Four BILLION is a lot of money to be discussing. 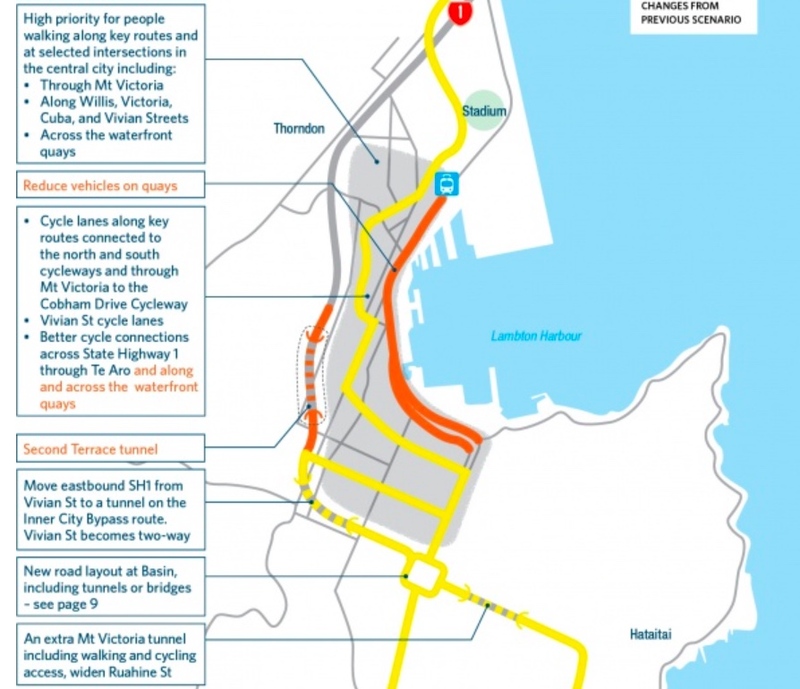 My thoughts are that instead of NZTA keeping that report to itself while LGWM spend the next year implementing a “detailed business case preparation”, and seeing as they are waiting for the Councils of the region to decide to help fund it, the LGWM plans should be released to the Public now. Either LGWM could release them, or NZTA, or WCC, or GWRC. I don’t really care where they come from – but the public need the opportunity to see what is being proposed. I’m aware of an OIA to NZTA for many of these rather elementary documents which was declined (JULY last year) “your request is being refused under section 18(d) of the OIA and section 17(d) of the LGOIMA as the information requested will soon be publicly available”. Also, it is *not* a done deal. Despite what “Tommo” described as local media “writing the future by accident”: talking about things in language that implies they’re a dead cert, thereby cultivating (albeit by accident) an expectation that they’ll be included. ex. the cancelling of the Peka-Peka interchange, plus the serious delays in deciding on the Melling interchange/bridge plus Petone-Grenada…. When Wellington had trams, they were narrow gauge (4ft) ,due to the tight curves and narrow streets. Now while its highly likely Wellington will use modern Standard Gauge trams (narrow gauge is bespoke= expensive) Wellington’s tighter curves and narrow streets will likely need narrower/shorter tram cars…. Auckland on the other hand would be able to run much wider and longer cars (which makes them cheaper) as they don’t have those constrictions…..
Granted there might be some savings on the back of shop stuff (electricity supply and physical track), but I would be very surprised if they ended up with common rolling stock…. I’m sure you have views on the conversation Levi was opening, Greenwelly – would love to hear them! (worth reading. Only 3 comments, but still worth it!). Oh, Captain Peacock! Well I never! Greenwelly, interesting theory about Wellington’s trams being 4ft gauge because of tight curves and narrow streets. I recall reading a WCC report about the introduction of electric trams and the proposed gauge, and I don’t recall either factor being mentioned – and if they were the reason, the 3’6″ NZ railway gauge would have been a much more obvious and logical choice. Whatever, a new system will be designed to avoid such things, and I suspect that our new trams will be as standard as possible. Whether that means they’ll bear any similarity with Auckland’s is another matter: our Matangi units are about as different as possible from their equivalents, the gauge being about the only technical feature that they have in common. And while length may be an issue, there’s no real reason as far as I can see why Auckland and Wellington trams shouldn’t be the same width, whatever the gauge. But it’s a bit of a myth that tight curves require narrow gauges – take a ride on Manchester’s airport line and you’ll see what I mean. It’s also a bit mythical that narrow gauge = bespoke, since the standard light rail gauge in Japan is 3’6″, and a metre in Switzerland and places in Germany.